Sprinter Caleb Ewan's sole focus is Milano-Sanremo, and his new team Lotto-Soudal is dedicated to backing him in "La Primavera." It was so close for Caleb Ewan. Hit pause on the YouTube clip of the 2018 Milano-Sanremo at the moment Vincenzo Nibali (Bahrain-Merida) crosses the line, and you see a blurry green and black figure perhaps four bike lengths behind Nibali. Ewan and his rocketing sprint nearly closed the deficit to the Italian in those final meters of the 298-kilometer race. Ewan (Lotto-Soudal) recently sat down with VeloNews to discuss his current quest to win Milano-Sanremo, which traces its familiar route across Italy’s northwestern coast this Saturday. He told us that the race is his primary focus for the first half of the season — the Tour de France is his big goal for the second half. The race is his only monument for the season, he said. It’s important to him. And Ewan has about as good a shot as the other top sprinters in the field. In late February he dropped a group of fast finishers on the uphill drag to Hatta Dam during stage 4 of the UAE Tour to claim his first WorldTour victory of the season. In March, Ewan grabbed two second-place finishes at Paris-Nice in duels with Groenewegen (Jumbo-Visma) and Sam Bennett (Bora-Hansgrohe, faster sprinters who may lack the climbing legs to survive Milano-Sanremo’s hilly finish. “It’s good for the confidence, especially going into Milano-Sanremo it’s good to have a win in a harder stage than maybe a typical sprint stage,” Ewan said. The hilly finish of Milano-Sanremo may derail Groenewegen, Bennett, and other heavier sprinters. The question within the peloton’s sprint class about the Milano-Sanremo finish is whether Ewan has the legs to challenge Fernando Gaviria (UAE Team Emirates) or Elia Viviani (Deceuninck-Quick-Step), both of whom can survive the hills. Ewan has not won outright against either sprinter this season. However, he has finished ahead of each man on occasions. Ewan believes he can win against them — it just comes down to his positioning in the finale. Of course, Milano-Sanremo may again fall to a solo attacker. Like dozens of riders who came before him, Ewan finds the Italian classic so frustrating because of the race’s unpredictable dynamics. It’s nearly 300km long and passes over just two measly little climbs. 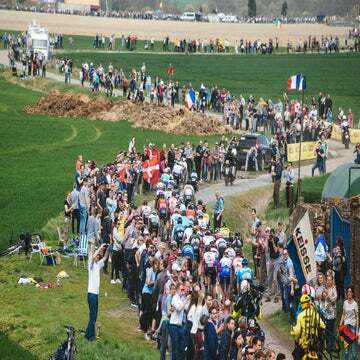 Even seasoned veterans cannot predict whether the race will end in a bunch sprint, a solo move, or a reduced group. And that distance saps the legs of their usual pop. The first time Ewan raced Milano-Sanremo, in 2017, he went to sprint and felt his legs turn to mush in the chaotic finale. He finished in 10th place. The strategy for a sprinter like Ewan is well-known to pro riders and fans alike. Use your teammates to chase down those aggressive attacks on the Poggio and Cipressa climbs, and then unleash a thundering kick on the Via Roma. In 2018, Ewan rode for Mitchelton-Scott, and had a lineup of brawny time trialists at his disposal. 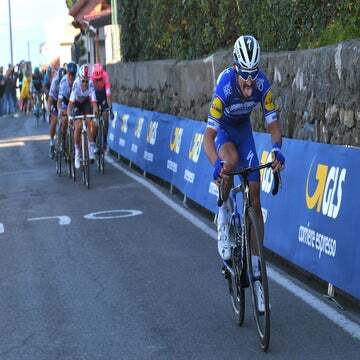 He also had Matteo Trentin, who attacked out of the bunch and mounted a daring, if unsuccessful, chase of Nibali in the waning kilometers. Trentin’s failed chase animated the final 5km, yet it did little to bring Ewan any closer to the finish line. This year, Ewan’s new team, Lotto-Soudal, is focused entirely on him. The squad’s lineup includes strong classics riders, a veteran captain in Adam Hansen, and Roger Kluge, himself a fast sprinter and lead-out man. Unlike in 2018, this squad has one rider to protect: Ewan. Lotto-Soudal is backing him to win, not star as the runner-up in the YouTube video. Nobody knows that better than Caleb Ewan.